Susa Amelia Young Dunford Gates was a writer, editor, and advocate for women’s rights and achievements in Utah. She founded the Young Woman’s Journal, which eventually became the official voice of the Young Ladies’ Mutual Improvement Association. She was also the founder and editor of the Relief Society Magazine, which became the official publication of the Relief Society organization of The Church of Jesus Christ of Latter-day Saints. Gates was the second daughter of Brigham Young and his wife Lucy Bigelow Young. She entered the University of Deseret at age thirteen and edited the student newspaper. She married Alma Bailey Dunford when she was sixteen and bore two children before they divorced after five years of marriage. Three years later she married Jacob F. Gates and had eleven more children; only four survived to adulthood. In 1878, she entered Brigham Young Academy in Provo, Utah, and although a student, founded the department of music and conducted a choir. She wrote nine books, which included a biography of her father, novels (The Little Missionary, John Stevens’ Courtship, and The Prince of Ur), a history of LDS women, and a history of the Young Women organization. Gates traveled around the world advocating for women’s advancements. She founded the National Household Economics Organization. 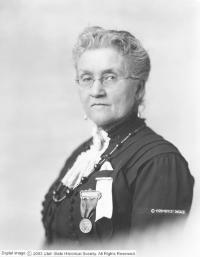 She served as an officer and delegate of the National Council of Women and as a speaker and delegate at congresses of the International Council of Women, addressing the topic “Equal Moral Standards for Men and Women.” She helped organize the Utah chapters of the Daughters of the Utah Pioneers, the Daughters of the American Revolution. She founded the Utah Women’s Press Club. Gates was a member of the Brigham Young University Board of Regents as well as the Board of Regents at Utah State Agricultural College. She was a devoted member of the LDS Church. In 1889 she served a mission with her husband to the Sandwich Islands. She was serving another mission with her husband when she suffered a nervous and physical breakdown. She was ill for three years until a priesthood blessing that promised her she would live to do temple work helped her begin a yearlong recovery. This page was last edited on 1 February 2017, at 12:52.